What sets you apart from your competition? A big part of marketing is emphasizing the distinction between you and your competitors. These are often referred to in marketing circles as your FABs, which is an acronym for Features, Advantages and Benefits (sometimes referred to as Features, Attributes and Benefits.) That works when you are selling a product. Your widget can be compared to the competition’s widget. But I want to focus on being distinct within the services industries. Especially those that are heavily regulated, so distinctions between one service and another is often not so noticeable by the customer. Industries like banking, insurance, financial services, accounting, education, etc. are all regulated and are limited on the services they offer either by licensing or government regulation. Marketing becomes a mantra of "we care about the customer,” and "customer service is our highest priority” which everyone in the service sector says. In other words, those taglines don’t set you apart. So how can a company within the service industry be marketed as distinct? You must do something that makes you memorable to the customer. Let me give you two examples of this from the service sector of insurance. Years ago I met a father and son who had an independent insurance agency in a small town. They had a very small staff, but they consistently outsold not only their competition, but other insurance agencies in their state - many of whom were in much larger metropolitan areas. They were selling the same products as the other agencies, they just sold more of it. They had the customer service gig down to a science, with their small staff jumping on each claim as soon as it came in their doors. 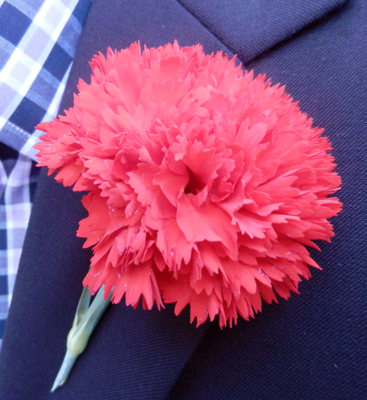 Their calling card became a very simple device that no one else did and it helped make them memorable in the minds of customers: they wore a fresh carnation in their lapel everywhere they went when they were conducting business. The principal of the agency told me that he had insured a local florist who was just starting out. He wanted to help them get off the ground, so he ordered a flower to wear each day of the week. It became so popular with his clients that they began to question him about it when he was not wearing a fresh boutonniere. He knew he was on to something. It helped the customer remember him. The other example is from an insurance executive who grew tired of handing out the typical trinkets that make up marketing specialties offerings – logo pens, notepads, mouse pads, water bottles, golf balls, etc. He decided he would take another route to being memorable. He handed out neckties! In a business where people still wear them, a fine silk necktie made a bigger impression than logo apparel did. He had taken a liking to a particular brand of ties from the McIlhenny Company, the makers, of all things, of Tabasco Sauce. He had a lot of compliments from people when he wore the ties, so he kept several dozen with him. When he met someone wearing a tie, he would tell them, "your tie is ugly! You need a better looking tie!” Then he would pull out his assortment of ties and tell them to take one! Memorable? You bet it was! People began to talk about the Tabasco tie guy and his generous ways. Do you think he would have gotten the same reaction had he given them a coffee cup with his logo on it? Forget the usual junk that gets passed around and no one really cares about. Do something original to make you and your company distinctive. Don’t do what everyone else is doing, be original. If you do, the customer will remember you. That’s what marketing is all about.